Background: Clinical assessment of cerebral concussion relies on the presence and duration of post concussive symptoms (PCS). Given that these PCS are subjective reports and not always specific to concussion, their usefulness remains to be validated. Objective: To evaluate the usefulness of self-reported PCS by means of cognitive tests and functional MRI (fMRI). Method: 28 male athletes with and without concussion were grouped according to their PCS score. They were then administered a computerised cognitive test battery and submitted to an fMRI session where cerebral activations associated with verbal and non-verbal working memory tasks were analysed. Results: Behaviourally, response accuracy and speed on the cognitive test battery were comparable for the control and low PCS group. The moderate PCS group showed significantly slower response times than the control group on the matching (p<0.05) and one-back tasks (p<0.05). The functional MRI study showed reduced task related activation patterns in the dorsolateral prefrontal cortex for both low and moderate PCS groups. Activation peaks outside the regions of interest, not seen in the control group, were also noted for both PCS groups. Regression analyses indicated an inverse relationship between PCS scores and performances on several CogSport subtests. Severity of PCS also predicted fMRI blood oxygen level dependent signal changes in cerebral prefrontal regions. Conclusion: Self-reported PCS is associated with an ongoing cerebral haemodynamic abnormality as well as with mild cognitive impairment. These results support the use of the PCS scale in the assessment of cerebral concussion and in monitoring recovery. Physicians involved in the care of concussed athletes frequently face the dilemma of when to allow a player to return to play. The challenge in making such a decision stems from the fact that sport related concussion does not produce a detectable structural lesion and few scientifically validated diagnostic instruments exist to help identify concussive brain injury and to determine concussion recovery.8 In the past, post concussion management has centred on the application of return to play guidelines which utilise an arbitrary period of mandatory exclusion following injury. As none of the published guidelines have been prospectively validated, it was recommended by the Vienna Conference on Concussion in Sport that they be abandoned in favour of an individualised assessment of recovery.9 A key element in determining clinical recovery from concussion is the presence of post concussive symptoms (PCS). Consequently, concussion symptom checklists have been added to several management guidelines. The present study was designed to define the relationship between self-reported PCS, neuropsychological performance and fMRI activation studies in a group of concussed athletes with persisting PCS who had suffered a complex concussion, as defined by the Prague Conference on Concussion in Sport.16 A concussion is considered “complex” when one or more of the following criteria are met: (1) specific sequelae, such as concussive convulsions; (2) loss of consciousness of more than 1 min; (3) persistent symptoms or prolonged cognitive impairment after the injury; and (4) history of multiple concussions over time. Our primary objective was to evaluate the use of a PCS score as a diagnostic indicator in complex concussion, and to investigate whether the severity of self-rated symptoms reflects the degree of ongoing behavioural and functional changes after a cerebral concussion. The participants consisted of 28 right handed male athletes from a combination of recreational, amateur and professional contact sports. Table 1 provides a detailed description of the sample. Moderate PCS group 2: athletes with a score of 22–84. Control group 3: remaining non-injured 10 elite athletes (mean age 21.9 (1.6) years; mean PCS score 0.6 (1); mean number of concussion 0.9 (1.36)), recruited from McGill varsity hockey and football teams. This group was selected in order to provide normative data as baseline PCS scores were not available from the concussed athletes. The control group had their pre-season baseline cognitive test performances and fMRI activation patterns assessed as part of an ongoing longitudinal study on sport related concussion. Participants in the control group were screened before the study to ensure that they had no neurological or psychiatric disorders, and that they did not have a concussion in the 12 months preceding the study. All subjects gave informed, written consent for their participation in the study, which was approved by the Research Ethics Board of the Montreal Neurological Institute and Hospital, McGill University. learning task: similar to the matching task, except each of the target pair turns face down after the first presentation of a matching pair to the target pair. Each participant was administered the CogSport battery using a Dell Inspiron 8200 laptop computer. The entire battery took approximately 30 min to complete, including practice. Measures on the speed (in ms) and accuracy (per cent correct) of the responses were collected and analysed separately. 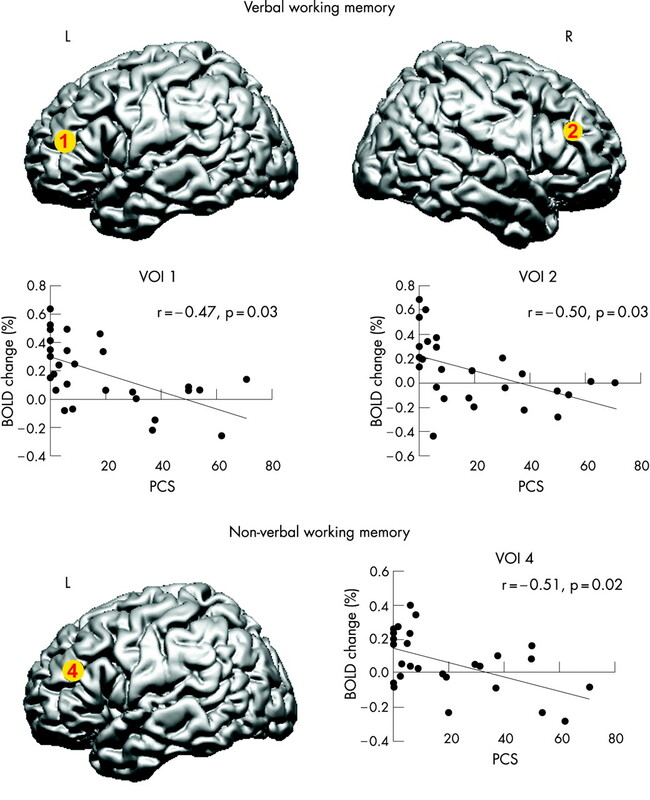 A verbal and a non-verbal working memory task (ie, experimental condition) and their corresponding control tasks (ie, baseline condition) were used for the fMRI studies. A full description of the experimental design has been published elsewhere.14 Briefly, the format of stimulus presentation, mode of response and timing of events were identical in both conditions, except they differed in terms of working memory requirements. The working memory task was adapted from Petrides’ externally ordered task,22 which requires the subjects to keep track of a serial presentation of four items (abstract words or abstract designs) randomly selected from a set of five, and to make a decision as to whether the target item, presented after a short delay, is among the four previously presented items. The subjects made their response by activating the appropriate mouse key. In the baseline control task condition, one item was presented four times successively followed by a short delay, after which one of two items associated with either a left or a right mouse button press was presented and the subjects had to make the right response. The subjects learned prior to scanning which one of these two items (two abstract designs or two abstract words for the visual and verbal versions of the task, respectively) was associated with a left mouse button press and which one with a right button press. The baseline task was introduced to obtain baseline activation and to “subtract out” any activation related to the motor and perceptual components of the working memory task. The fMRI scanning was carried out using a 1.5 Tesla Siemens Sonata scanner (Siemens AG, Erlangen, Germany). Each scanning session started with acquisition of high resolution (1 mm3) T1 weighted three dimensional structural images for anatomical localisation of the functional data. Brain activation was then measured using blood oxygenation level dependent (BOLD) fMRI, by means of a T2* weighted gradient echo planar imaging sequence (TR 3000 ms, TE 51 ms, FA 90). A total of 120 acquisitions were collected in each functional scan. Twenty oblique, contiguous slices covering the entire brain (7 mm thickness, −35° relative to the AC-PC line, interleaved excitation order) were taken during each acquisition. Four functional scans (two for the verbal working memory condition and its control and two for the non-verbal working memory condition and its control) were acquired in a single session. Each functional scan consisted of six alternating blocks (60 s each) of working memory and baseline conditions. All stimuli were presented via an LCD projector to a screen placed in front of the scanner, and then to the subject via a mirror mounted on the head coil. All subjects underwent a routine MRI examination, including axial T2 weighted turbo spin echo (TR 3910 ms, TE 81 ms, FA 150) and axial fluid attenuated inversion recovery (TR 9000 ms, TE 66 ms, FA 180) sequences. These MR images, as well as the T1 weighted three dimensional gradient echo images acquired as part of the functional scans, were evaluated by an expert clinical neuroradiologist for obvious signs of axonal injury and/or abnormal signal intensity, size and location in the brain. Before statistical analyses, all frames in each dynamic file were first realigned to the fourth frame in that run to correct transient head movements caused by breathing and swallowing during data acquisition. The images were then spatially smoothed with a 6 mm full width at half maximum Gaussian filter to increase the signal-to-noise ratio of the data, the tolerance of the subsequent analysis steps to residual motion in the scans and to minimise resampling artefacts. The motion corrected data were analysed statistically using fmristat.23 The fMRI time series data from the verbal and non-verbal tasks were analysed separately. For both tasks, a working memory minus baseline control task subtraction was performed. Significant BOLD changes were determined at each voxel, based on a linear model with correlated errors. The mean parametric t maps were constructed for each individual by averaging functional data across scans using linear regression analyses. To obtain the average group t maps, all individual data were first normalised to the Montreal Neurological Institute template (MNI305) constructed from average stereotaxic MRI of 305 normal subjects, and then combined using a mixed effects linear model. The resulting T statistic images were thresholded using the minimum given by a Bonferroni correction and random field theory24 to correct for multiple comparisons. A directed search method was used to calculate the threshold, using an estimated gray matter volume of 64000 mm3 of the dorsal prefrontal area. This yielded a threshold value of t = 4.2, p<0.05. Each set of fMRI data was then co-registered to the corresponding anatomical MRI, which was corrected for intensity non-uniformity25 and normalised to MNI305 standard stereotaxic space. Analysis of covariance was employed using age as a covariate to control for this possible confounding factor. For both response speed and accuracy measures from the CogSport battery, statistical analyses were carried out on the normalised data (arcsine transformation for accuracy data and log10 transformation for response time data). Statistical analyses were also performed on response speed and accuracy from the working memory and the control tasks during the fMRI session. Bonferroni correction was used for post hoc analysis to control for multiple comparisons. Finally, multiple regressions with PCS as the main predictor and age as the confounding factor was carried out to measure: (1) the relationship between self-reported PCS scores and results on response accuracy and reaction time on the CogSport tests; and (2) PCS scores and their association with fMRI BOLD signal change in each voxel of interest. Although ANOVA indicated that the control group was significantly younger than the moderate PCS groups (p<0.01), no significant age difference was found between the concussed groups. In addition, the concussed groups did not differ in terms of the number of previous concussions and time since injury. ANCOVA revealed a significant main effect for group on the choice reaction time task (F(2,27) = 5.17, p = 0.01). Post hoc tests indicated that the low PCS group 1 performed significantly better than the moderate PCS group 2 (p = 0.01) on this task. There was no difference between control group 3 and the two concussed groups on any of the other CogSport subtests. In most cases, all groups performed near ceiling on the other subtests of the battery. ANCOVA revealed a significant main effect for groups on the one back task (F(2,27) = 10.43, p<0.01), choice reaction time (F(2,27) = 3.98, p = 0.03) and matching tasks (F(2,27) = 5.89, p<0.01). Bonferroni corrected post hoc tests showed that control group 3 was significantly faster than the moderate PCS group 2 on the one back (p<0.01) and matching tasks (p = 0.02). The low PCS group 1 was also significantly faster than the moderate PCS group 2 on these two tasks (p<0.01), as well as on the choice reaction time task (p = 0.03). No significant difference was found between control group 3 and the low PCS group 1. Table 2 summarises group mean response accuracy and speed scores. Regression analyses indicated that PCS score predicted performances on several CogSport subtests. For response speed, a higher PCS score predicted a slower performance on the following CogSport subtests: complex reaction time (r = 0.551, p<0.05), choice reaction time (r = 0.69, p<0.01), one back task (r = 0.885, p<0.01) and matching task (r = 0.61, p<0.01). For response accuracy, a higher PCS score was associated with less accurate performance on the choice reaction time (r = −0.774, p<0.01), one back (r = −0.591, p<0.05) and incidental learning tasks (r = −0.524, p = 0.05). Age did not account significantly for the performance on either response time or accuracy on any of the CogSport subtests. All MR images were evaluated by a clinical neuroradiologist, and were found to be normal. ANCOVA with age as the covariate was performed on the accuracy (percentage correct) and speed (response speed in milliseconds) data from the working memory and the control tasks collected during the fMRI session. With regard to performance accuracy, ANCOVA revealed a significant main effect of group on the verbal working memory task (F(2,27) = 4.04, p<0.05), verbal control task (F(2,27) = 8.86, p<0.01) and visual control task (F(2,27) = 5.02, p = 0.01). Post hoc tests indicated that the low PCS group 1 performed comparably with the control group 3 on both versions of the working memory task; in addition, this group did significantly better than the moderate PCS group 2 on the verbal working memory (p = 0.05), and the verbal (p<0.01) and visual control tasks (p = 0.01). The moderate PCS group 2 performed less well on all tasks but was not significantly different than the control group 3 (p>0.05). Table 3 summarises the behavioural results. In terms of response speed, both concussed groups responded faster than the control group 3 (table 3). Statistical analyses indicated that the low PCS group 1 responded significantly faster than the control group 3 on the verbal working memory task (F(2,27) = 2.33, p<0.05). No significant group difference was found for the other tasks. Figure 1 Functional MRI. 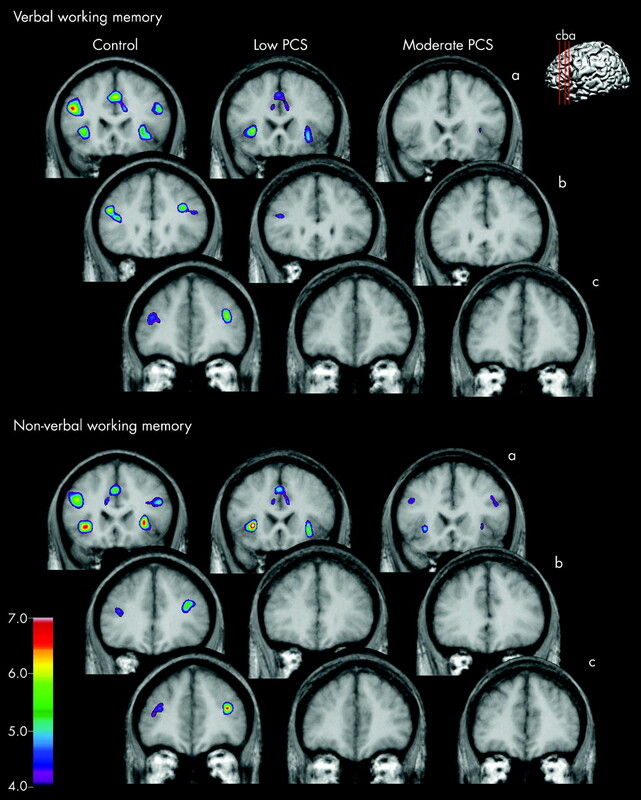 Group average activation maps for the verbal and non-verbal working memory tasks, superimposed on each group’s average MRI. Note: a, b, c = slice level in the prefrontal cortex. PCS, post concussive symptoms. Figure 2 Additional activation in the posterior brain region. Both mild and moderate post concussive symptom (PCS) groups showed additional activation peaks in the left temporal lobe (circled in red) during the verbal working memory task. These peaks were not present in the normal control group. Volumes of interest (VOI) analyses were carried out to quantify the observed difference in the activation patterns. Nine VOIs (five for the verbal and four for the non-verbal tasks) were identified using the average activation map of control group 3. These regions were defined as an 8 mm3 sphere centred at the voxel where significant task related activity was detected. The corresponding mean per cent BOLD signal change from the control to working memory condition was then calculated for each group. ANCOVA with age as covariate revealed a significant effect of group in five out of the nine VOIs (table 4). Post hoc analyses indicated that moderate PCS group 2 had significantly less BOLD signal increases than control group 3 in all five VOIs while the low PCS group 1 had less BOLD signals than the controls in VOIs 2 and 4 for the verbal and non-verbal tasks, respectively. To examine further the relationship between self-reported PCS and fMRI activation patterns, voxel wise regression analyses were performed on the entire fMRI time series using PCS scores as predictor and age as covariate. This allowed identification of brain regions where changes in BOLD signals were modulated by PCS, independent of group assignment. After removing the effect of age, three prefrontal areas (two for the verbal and one for the non-verbal tasks) showed significant negative PCS–BOLD relationships (fig 3). Specifically, high PCS score was associated with reduced activation in prefrontal areas that correspond to VOI 1 (r = −0.47, p = 0.03), VOI 2 (r = −0.50, p = 0.03) and VOI 4 (r = −0.51, p = 0.02) identified from the average activation map. Because it is an unbiased analysis which makes no assumption about categorisation according to PCS score or where in the brain PCS related effects will appear, these findings support our grouping criteria according to PCS score. They also demonstrate the sensitivity of fMRI in detecting PCS related changes. Figure 3 Voxel wise regression analysis between post concussive symptom (PCS) score and blood oxygen level dependent (BOLD) change. Prefrontal region showing significant PCS–BOLD correlation is marked in yellow with its corresponding volume of interest (VOI) number on the three dimensional brain. The scatterplots show the BOLD responses in those regions as a function of PCS score. Higher PCS score predicted less per cent BOLD signal change. While the results from the computerised cognitive tests used in the present study and the fMRI findings concur for the moderate symptoms group, some discrepancy exists between the measures in the low PCS group. Behaviourally, the athletes in this group performed as well as the control subjects, yet they exhibited less cerebral activity relative to the control group when performing the working memory task that was part of the neuroimaging study. Several studies have reported links between PCS scores and cognitive impairment.18 19 29 30 Lovell and colleagues19 reported that cognitive impairment following sport related concussion and its subsequent resolution paralleled the course of PCS presentation, although their finding has been disputed because of the definitions used. Iverson and colleagues31 found a correlation between self-reported fogginess and cognitive performance, where athletes with persisting fogginess displayed slower reaction time and information processing speed, and poorer memory performance. Similarly, Collins and colleagues29 demonstrated that headache, one of the most frequent symptom reported after a cerebral concussion, was associated with worse performance on reaction time and memory tasks, and concussed athletes with more severe headaches had significantly more PCS compared with those with mild headache (but see Makdissi and colleagues32). With regard to neuroimaging, there is a paucity of studies that attempt to investigate the underlying changes in brain physiology in relation to self-reported PCS. Functional MRI offers such an opportunity as it provides an indirect physiological index of brain activity, and because of its non-invasive nature, it has become the method of choice for making brain behaviour inferences under normal and various neurological disease states. Few studies have employed this imaging method to investigate mild head injury and sport related concussion.14 15 In a prospective study using fMRI and finger sequencing, serial calculation and digit span tasks, Jantzen and colleagues15 reported significantly greater within subject increases in brain activity among athletes with concussion than control subjects. Similarly, in an fMRI study that involved non-athletes with mild traumatic brain injury, McAllister and colleagues33 found that 1 month after the injury, patients with mild traumatic brain injury showed a greater increase in brain activity than control subjects when the working memory demand increased during the n-back task. These apparently contradictory results may be explained by the fact that fMRI activation studies are primarily based on subtraction of the experimental and baseline tasks. Both our working memory and baseline tasks differed significantly from those reported in the literature and this may account for the different (but not necessarily conflicting) results between other fMRI studies and our own. Thus a direct comparison between fMRI studies that use different paradigms may not be indicated. Rather, we favour an approach where differences in brain activations are identified in normal and concussed individuals when the scanning takes place under identical conditions. In this regard, the most significant findings across fMRI studies on concussion are that individuals with the mildest form of brain injury still display atypical brain activity compared with a normal control group. Some potential limitations of the present study merit consideration. One is its small sample size which could, in part, explain the absence of differences in cognitive performances between the low PCS and the control groups. Alternatively, any detected group difference in such a small sample could represent a large and genuine effect. Thus we found that the fMRI activation patterns of both PCS groups differed from those of the control subjects, and that the moderate PCS group showed poorer performances on some cognitive tests compared with the control group. Another possible limitation concerns the generalisability of our findings. Our study focused primarily on sports related concussions in young male athletes. This sampling limits the applicability of our findings to the concussed athlete and head injury populations at large. Finally, our control group differed from the concussed groups in that it was made up of varsity athletes whereas the concussed groups consisted of athletes at the recreational and professional levels. This difference is, however, minimised by the fact that all of the subjects were elite athletes who played the same sports (ie, hockey or football) at a competitive level. We are grateful to Mary Mooney, Lynn Bookalam and James Hieminga for their help in recruitment of subjects and coordination of testing. We also thank Véronique Desrochers for administering the CogSport battery.
. Concussion among Swedish elite ice hockey players. Br J Sports Med 1996;30:251–5.
. Evidence-based review of sport-related concussion: clinical science. Clin J Sport Med 2001;11:150–9.
. Relationships among postconcussional-type symptoms, depression, and anxiety in neurologically normal young adults and victims of brain injury. Arch Clin Neuropsychol 2001;16:435–45.
. Base rate and simulated symptoms of mild head injury among normals. Arch Clin Neuropsychol 1994;9:411–25.
. Examination of “postconcussion-like” symptoms in a healthy sample. Appl Neuropsychol 2003;10:137–44.
. Relationship between stress, coping, and post concussion symptoms in a healthy adult population. Arch Clin Neuropsychol 1998;13:415–24.
. Evidence for the factorial and construct validity of a self-report concussion symptoms scale. J Athl Train 2003;38:104–12.
. Grade 1 or “ding” concussions in high school athletes. Am J Sports Med 2004;32:47–54.
. The effects of practice on the cognitive test performance of neurologically normal individuals assessed at brief test-retest intervals. J Int Neuropsychol Soc 2003;9:419–28.
. Increased activation of the mid-dorsolateral frontal cortex during the monitoring of abstract visual and verbal stimuli. Proceedings of 7th International Conference of Functional Mapping of Human Brain, Brighton, UK, 2001;7:S721.
. A general statistical analysis for fMRI data. NeuroImage 2002;15:1–15.
. A unified statistical approach for determining significant signals in images of cerebral activation. Hum Brain Mapp 1996;4:58–73.
. A nonparametric method for automatic correction of intensity nonuniformity in MRI data. IEEE Trans Med Imaging 1998;17:87–97.
. Differential activation of the human orbital, mid-ventrolateral, and mid-dorsolateral prefrontal cortex during the processing of visual stimuli. Proc Natl Acad Sci U S A 2002;99:5649–54.
. Activity in ventrolateral and mid-dorsolateral prefrontal cortex during nonspatial visual working memory processing: evidence from functional magnetic resonance imaging. NeuroImage 2000;11:392–9.
. The role of the lateral frontal cortex in mnemonic processing: the contribution of functional neuroimaging. Exp Brain Res 2000;133:33–43.
. Relationship between postconcussion headache and neuropsychological test performance in high school athletes. Am J Sports Med 2003;31:168–73.
. Symptom-based assessment of the severity of a concussion. J Neurosurg 2003;98:477–84.
. Differentiating concussion from post-traumatic headaches in Australian footballers—A pilot study. Med Sci Sports Exerc 2003;35(5 Suppl 1):S321.
. Brain activation during working memory 1 month after mild traumatic brain injury. A functional MRI study. Neurology 1999;53:1300–8. Funding support: This study was supported by a grant from CASM/NHL and CIHR operating grant MOP-64271. The funding agencies were not involved in the design and conduct of the study; the collection, management, analysis and interpretation of the data; or in the preparation, review and submission of the manuscript. Competing interests: At the time of writing this manuscript, Dr Collie was an employee of CogState Ltd, the manufacturer of the CogSport tests described in this paper. None of the other authors have any financial interest in CogState Ltd or any other conflict of interest.